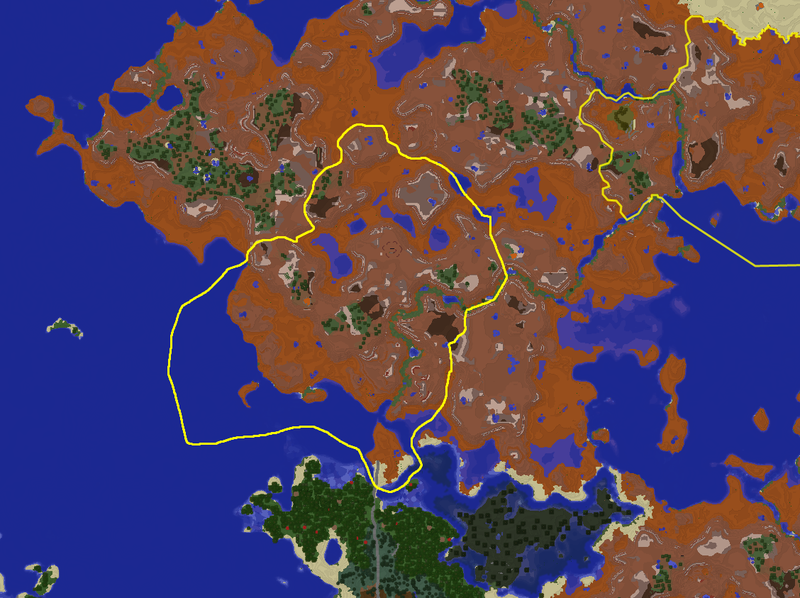 So I established a small colony here long ago with a clay mine and a protal that the nether mesa horse road leads to, and The Lime Road/"The Gay Mesa Road" in the overworld ends by this area. Now I request to claim this area shown in yellow in the southwestern part of the image. Future plans are an extension to The Lime Road that should eventually lead beyond the areas near Ione, expansion to the clay mines and possibly other infrastructure. It will also be a priority to preserve the natural mesa landscape while mining and building, the mines will be almost fully underground and not visible from the surface in most areas. You can discuss the proposal now. If there are no complaints, I'll start voting soon. As I plan to claim the red region eventually (once I build my bridge there and develop it a bit) I'd prefer, just for convenience, that you'd not claim the green region. I'd suggest maybe the blue instead? However if you're so keen on claiming the green region sure I can vote for it. You already have Transderemic with Kip? I remember discussing a month or so ago with you that you'd be fine with me claiming that region if I dropped Transderemic. So I did. Ok, why is the green area important to you? It's not very important to me but it's pretty close to the base I've built so I thought I'd claim it. It's not important to me, but when i mine out the mesa it'd be simpler just for me to be able to mine out that whole north part instead of paying attention to borders. It won't be a straight line but follow the terrain. But if you want to mine in the green area I can give you permission to do that even if the borders remain this way if you want that. Do you plan to mine out only the insides of the mesa or make a mine that's visible from above ground?